A fiddler crab, of species Uca pugnax, resident of the Ashepoo Combahee Edisto (ACE) Basin National Estuarine Research Reserve in South Carolina, USA. 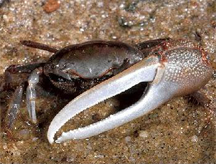 Males use their one outsized claw in courtship and in fighting other males. In some species, when a male loses this claw, it regenerates, but the regenerated claw is less massive than the original, both in shell and muscle. Although regenerated claws are weaker, they do deceive females and other males. This phenomenon is known as dishonest signaling. In natural populations of Uca annulipes, as many as 44% of males possess regenerated claws. See P.R.Y. Backwell, et. al., "Dishonest signaling in a fiddler crab," Proc. R. Soc. Lond. B (2000) 267, 719-724. In virtual teams, as described in this article, some people undertake deception by means of dishonest signaling. They conceal problems in their areas of responsibility, or they misstate the views of the subteams they represent. In some cases, this dishonest signaling might be helpful, while in others it is decidedly unhelpful. The study of organizational dishonesty is beginning to progress. See, for example, Cialdini, R. B., P. K. Petrova and N. Goldstein, "The hidden cost of organizational dishonesty," MIT Sloan Management Review (Spring 2004): 67-73. I'm unaware of any studies of dishonest signaling in virtual teams specifically, but I'm willing to assume that it is more malignant than benign. Photo by U.S. National Oceanic and Atmospheric Administration courtesy Wikipedia. Members of virtual teams see each other less often than do members of co-located teams. Often, they don't know each other as well, and they face numerous challenges in building and maintaining trust. These factors make virtual teams vulnerable to the tactics of political operators. Here's Part II of a catalog of those vulnerabilities. See "Communication Traps for Virtual Teams: I," Point Lookout for May 26, 2010, for more. Image management is the practice of managing perceptions of a policy, a system, an effort, a person, or just about anything else. When someone realizes that others' perceptions don't align with what he or she would wish, deceptions are available to bring about a more desirable alignment. These steps include spin, omissions, inappropriate emphasis, delays in disclosure, obstructions of various kinds, and simple lies. In co-located teams, such deceptive methods are risky, because the audience usually has independent information sources, beyond the reach of image managers. In the co-located environment, another challenge for the aspiring image manager is frequency of refresh: the co-located audience can obtain independent information much more frequently than the virtual audience can. Thus, effective co-located image management requires continuous effort and considerable dedication. In the virtual environment, the image manager can be much more effective with a lot less effort. To counter these deceptions, begin by identifying anyone who might be engaged in image management. Usually, image management creates counter-action from those who feel that the image manager is unfairly characterizing them or their work. Private conversations with those involved are often helpful in determining what's really happening. in virtual teamsSometimes such representatives of others are tempted to misrepresent the views of those they represent. The misrepresentation can be subtle and almost innocent, or it can be blatant, but in any case it can create problems. In co-located teams, groups do send delegates to meetings, but the temptation to misrepresent is less intense, because the loop back from the audience of the misrepresenter to the people being misrepresented is more likely to close. When it does, misrepresentations become obvious, and misrepresenters pay a high price. Virtual teams can gain control over such misrepresentations by recording meetings and distributing the recordings, or by including in meeting minutes not only the usual decisions and actions items, but also any representations made by those in attendance. Either technique helps achieve the "closed loop" that deters misrepresentation in co-located teams. Would you like to see your comments posted here? rbrenZpExozkMPwrNYGqQner@ChaceNvBVpqXCBtIVdAzoCanyon.comSend me your comments by email, or by Web form. I offer email and telephone coaching at both corporate and individual rates. Contact Rick for details at rbrenJwynDODThTnEEJqbner@ChacXYqKMVhBMQGNyItPoCanyon.com or (650) 787-6475, or toll-free in the continental US at (866) 378-5470.